Pioneers in the industry, we offer magnetic billet handling system, rectangular load lifting magnets and magnalift rectangular lifting magnets from India. Our organization has achieved milestone in offering Magnetic Billet Handling System to our clients. 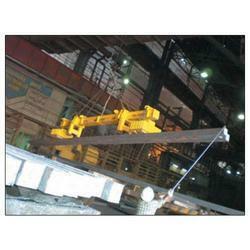 Magnetic Billet Handling System has been fabricated by using top grade material and advanced technology. Provided product is appreciated for its excellent design and functionality and is available in latest specifications as well. We are offering an excellent assortment to our customer base to fulfill their specific requirements. Besides, it is available at convenient price. Typically for storing/ unloading & handling of billets. Hot billet in Steel Melting Shop can be handled. Handling of Billets/ Blooms up to 600°C (in core). Single layer of material can be handled. 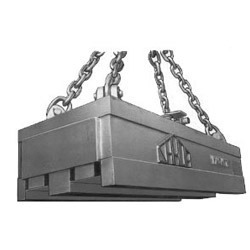 Our organization has risen to prominence in offering Rectangular Load Lifting Magnets to our clients. Rectangular Load Lifting Magnets are complemented for their excellent strength magnetic field and are offered in various dimensions. These products are presented in latest series to our clients in order to fulfill the industrial demands. Provided product is considered for different industrial sectors. It is associated with deep penetrating electromagnetic field and is useful for lifting scraps. Optional battery back up can be supplied. Magnets with Aluminium winding coil in various sizes are also available tHe ordering code for the same are 22101. Spreader Beams suitable for 6 /9 or 12 meter billets/ plates are also supplied as per customers’ specification. Aluminium and Copper Conductor wound coil with class H/C insulation. Completely sealed with thermal conductive compound and protected terminal box. Custom designed poles for special profiles. With our rich industry experience and expertise we are offering Magnalift Rectangular Lifting Magnets to our clients. 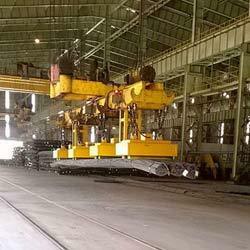 Provided range is applicable for handling of rebar. These products are provided with various types of magnets and are exceptional in terms of design and functionality. These products are compact as well as light weight. We have hired best industry specialists for checking complete assortment who assure the quality of these products. Spreader Beams suitable for 6 /9 or 12 m billets/ plates are also supplied as per customers’ specification. Compact, light weight & increased heavy duty cycle. Custom designed poles for special lifting capacities. Looking for Magnetic Lifter For Billet Handling ?